Christmas devastation: Logs swept by flash floods lie in a village in Salvador, Lanao del Norte, in southern Philippines. Photo: Reuters, Richel V Umel. CARITAS Australia has sent $50,000 to assist a region in the Philippines that was thrashed by a tropical cyclone just before Christmas. Typhoon Tembin, also known in the Philippines as Typhoon Vinta, hit the Caraga municipality on the north-eastern section of the island of Mindanao on December 24, leaving at least 267 people dead. Staff and volunteers from Caritas’ international network, which includes Australia, offered emergency assistance and support for people who had lost everything in the storm. Caritas Australia’s senior programs co-ordinator for emergencies Richard Forsythe said the quick response from the Caritas network had prevented further deaths. “The efforts of Caritas Philippines and other partners in pre-positioning essential relief materials and evacuation centres have prevented the potential for further loss of life,” Mr Forsythe said. Cyclone Tembin followed damages caused by Tropical Depression Kai-Tak, which fell over San Policarpo, in central Philippines, on December 16. The devastation has caused excessive trauma to people on Mindanao, who endured a five-month conflict when Islamic militants attacked the region during the Marawi siege last year. Terrorists attacked the region from May but the battle ended in October. The region is now in recovery mode after flash flooding and landslides caused by Typhoon Tembin led to numerous deaths as well as damage to homes and farmland. The Philippines National Disaster Risk Reduction and Management Council (NDRRMC) said more than 280,000 families were affected. 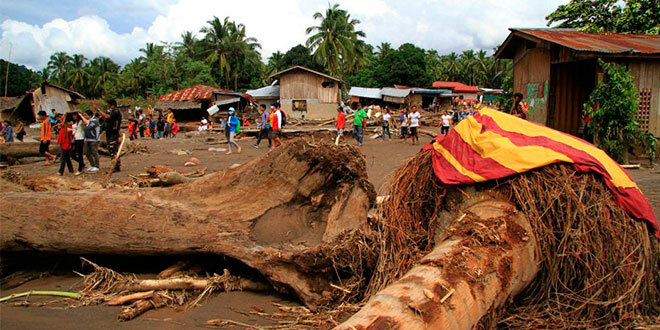 Holiday horror: Damage caused by the cyclone in Lanao del Norte province. Photo: NASSA/Caritas Philippines. Umpia Dura, who lives in southern Philippines, said the presence of Caritas Philippines was reassuring to people in the wake of the disastrous storm. “I thank you for coming here to check on my rice mill, I thank you with infinite gratitude,” Mr Dura said. Pope Francis offered prayers during his December 24 midday Angelus for the people of Mindanao affected by the severe cyclone. “I also wish to assure my prayer to the population of the island of Mindanao in the Philippines, affected by a storm that has caused numerous victims and destructions,” the Holy Father said. Archbishop of Manila Cardinal Luis Antonio Tagle urged Catholics to help the victims of the two storms that hit last month. “Christmas means helping each other, just as Jesus did,” Cardinal Tagle said. Food, water and clothing are now the priority for Caritas’ international network, co-ordinated by Caritas Philippines. More than 500 families have already received food packages, and many more are expected to receive assistance. 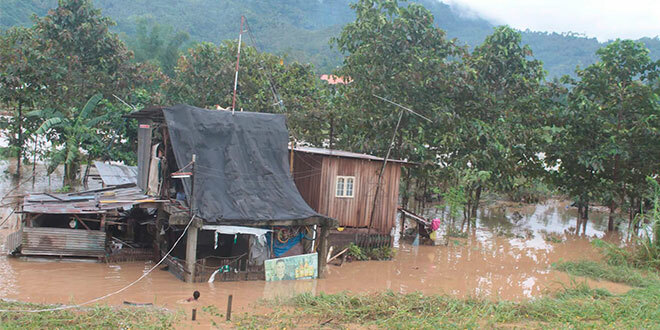 Donate to Caritas Australia’s emergency response supporting people affected by Typhoon Tembin here.